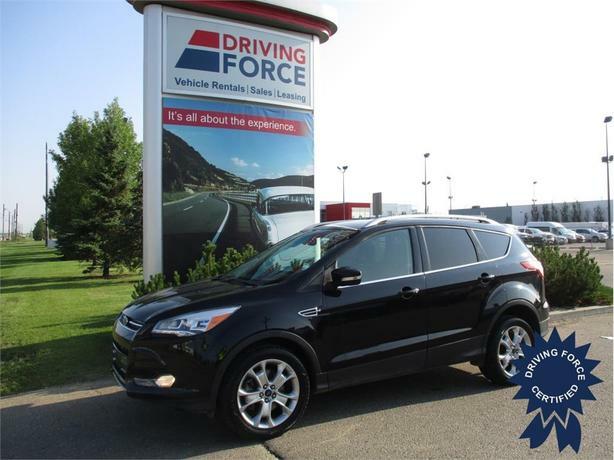 This 2016 Ford Escape Titanium 4X4 SUV comes with plenty of space for up to five passengers, 6-speed automatic transmission with SelectShift, 18-inch alloy sparkle nickel painted wheels, heated leather-trimmed bucket seats with 60/40 rear seat configuration, power panoramic vista roof, front and rear all-weather floor mats, voice-activated navigation system with Sony Audio System, 3.07 axle ratio, block heater, gas-pressurized shock absorbers, front and rear anti-roll bars, electric power-assist speed-sensing steering, permanent locking hubs, strut front suspension with coil springs, short and long arm rear suspension with coil springs, deep tinted glass, chrome grille, power liftgate rear cargo access, front fog lamps, perimeter/approach lights, ten speakers, auxiliary input audio jack, auto volume control, SYNC 3 Communications and Entertainment System with rear view camera, enhanced voice recognition, 8-inch centre LCD touch screen with swiping and punch-to-zoom capabilities, AppLink, 911 Assist, and two smart charging USB ports, 10-way power driver adjustable seat, power rear windows and fixed third row windows, leather/metal-look steering wheel, three 12V DC power outlets, compass, keypad, proximity key for doors and push button start, garage door transmitter, illuminated glove box, leatherette door trim insert, front and rear map lights, rear parking sensors, low tire pressure warning system, 1 AC power outlet, and 2.0-litre Ecoboost engine providing 231 horsepower at 5500 RPM and 270 lb-ft of torque at 3000 RPM. The GVWR rating is 4,840 lbs (2,195 kgs). With so much to explore in this vehicle, schedule an appointment with one of our knowledgeable sales consultants to see this SUV up close and in person with your hands around the steering wheel. If you need financing options, ask about our in-house financing plans that are right for you. This vehicle is within your reach.